This was a sad sight on the roads of eastern Cameroon. 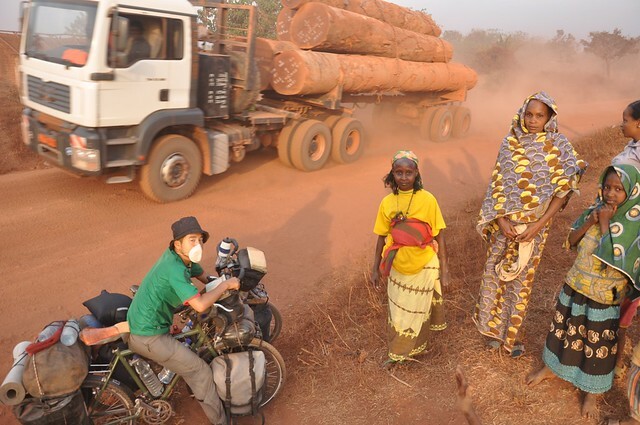 Dozens of logging trucks thundered towards me each day as I headed towards the border with the Central African Republic. Some of those trunks must have been hundreds of years old, destined to become furniture for people on another continent. The drivers rarely slowed down as their vehicles kicked up clouds of red dust into the air. I resulted to wearing a facemask, as did Hiromu, the Japanese cyclist I would continue to cycle with until the Congo DRC. Vegetation and huts along the roadside were covered in this red dust. I wondered why people, like this group of Fula-speaking women, didn’t move their homes further away from the road. Deforestation in Africa is happening at a rate four times faster than anywhere else in the World. Local people have no voice or rights to their land being stripped of its natural resources. In West Africa I saw very little virgin forest. In Central Africa it is disappearing quickly too. Were the region more stable that speed of deforestation might increase even further. Needless to say the cycling wasn’t all that enjoyable. You can read the blog post during my time in this part of Africa here.